BHC Peon Vacancy 72 Posts Recruitment 2018 (Aurangabad) Shortlist of candidates eligible for Viva announced. Interview being conducted as per schedule. Interview Result will release soon. Answer Key for the Peon/Junior Clerk Screening Test is out on 28th June. Now, the candidates are waiting for the Bombay High Court Peon Result 2018 which will be available on 30th June. Download Answer Key – Click here. Notice Regarding the key, District Court, Pune – Click here. As per the authority, many candidates did not submit a printout of application forms during the collection of hall tickets. So, the authority decided to prepare the second round of shortlisting of candidates. Shortlisted candidates have to collect their hall tickets within 21st June to appear in the screening test. Additional Shortlist Download – Click here. 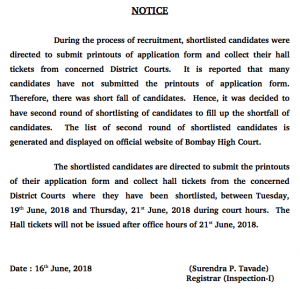 Bombay High Court Junior Clerk, Peon, Hamals Stenographer Shortlists for the written / screening test 2018 finally released on 1st June 2018. Download the BHC recruitment list from the link given below. Earlier Bombay HC recently canceled the recruitment for the 8921 posts of Stenographer, Jr Clerk, Peon posts by a writ petition. Later fresh recruitment dates were announced and new dates of filling up application forms were announced. Cut Off Marks may also be found on the shortlist file. Name and registration number wise merit list has been formed. 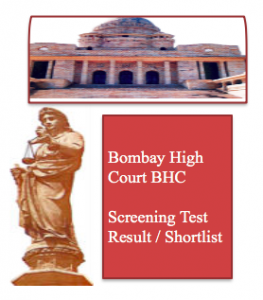 Download Shortlist for Bombay High Court – Click here. (Get Admit Card downloading process for Shortlisted candidates for Screening Exam 2018). Download Notice Regarding the Candidates who already filled up application form earlier – Click here. Download the cancellation notice – in English / in Marathi released on bombayhighcourt.nic.in. Bombay High Court released shortlist of candidates eligible for Viva voce test in connection with Peon Post. The shortlisted candidates are eligible for appearing in the Bombay High Court Peon interview 2018. BHC on their official website has uploaded Names, Registration ID and district of the shortlisted candidates. Link to download the PDF file is given below. Total 408 candidates have been selected for the viva-voce. Schedule of the interview is also given below. Download the Shortlist in PDF file to check instructions for the qualified candidates to appear in the interview. Qualified candidates for Screening / Written Test. 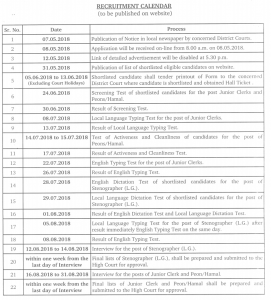 The result of the Bombay High Court recruitment examination for the posts of Stenographer, Jr.Clerk and Peon or Hamal will be published on separate dates. The final list / result for recruiting Stenographer will be released on 20th July 2018 and for the other two posts- Junior Clerk and Peon / Hamal will be out on 7th August 2018. The result will be available for the candidates on the website https://bhc.gov.in/bhrecruitment/. The candidates will be able to check it providing their roll number / enrolment number and or other valid details. At first the Bombay High Court recruitment board will sort the submitted online applications and a list will be released (on 16.04.2018) containing the names of the shortlisted candidates. There will be different methods of selection for all the four posts. For the posts of Junior Clerk and Peon / Hamals, the shortlisting preparation based on the application submitted is the first step. Thereafter screening test will be held for the posts of Jr.Clerks and Peons/Hamals on 06.05.2018. After screening test, the successful candidates in the ratio of 1:7 against the total number of vacancies will be called for the Typing test. There will be local language typing test and English language typing test for the post of Junior Clerk. For the post of Peon/ Hamal, test of activeness and cleanliness will be conducted. After that Interview will be conducted for both the posts and on the basis of all the above mentioned steps, final merit list will be prepared and released. For the post of Stenographer (L.G) there won’t be any screening test. The candidates shortlisted after primary sorting of the online applications will be called for the English language dictation test as well as local language dictation test. The merit list declaring the names of the successful candidates after the dictation test will be published on 27.06.2018. Then on 01.07.2018 the selected candidates must appear for the local language and English language typing test. Each will carry 20 marks. After this, Interview will get conducted and then Bombay High Court will publish the final merit list for the post of Stenographer. Also check WB GDS Merit List 2018 Check Result. The recruitment authority of Bombay High Court has declared that no bench mark has been fixed for the selection of Stenographer, Junior Clerk and Peon / Hamal. 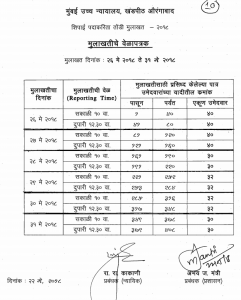 Though the cut off marks shall be 35% with relaxation of 5% marks for the candidates belonging to the reserved category. So, as the Bombay high Court is yet to declare the result for the screening test, candidates should prepare for it. It will be a huge opportunity for candidates as the BHC may conduct a fresh recruitment notification / exam within some days. So they should prepare well in advance for the screening test. please provide the peon shortlist file.as i checked my name is not found that list. Sir maz nav nahi list madh as KS ky zhal br ata aapn KY karu shtko ka ????? most probably, aapko BHC ne shortlist nehi kiya h for screening test. Sir mera app id DCR 130168 HAI PAR MERA NAAM LIST ME NAHI HAI SO WHAT CAN I DO ? Sir mera app id DHC89140 HAI PAR MERA NAAM LIST ME NAHI HAI SO WHAT CAN I DO ? I don’t understand, How Jr. clerk list is prepared. we have filled all form properly, but didn’t get name in this list. ८९२१ जागांसाठी भरती असताना, शोर्टलिस्ट फक्त १७५० ची ????????????????? Hello sir when will establish list. we are waiting for this. we know everybody is waiting for the junior clerk result list. But due to some reason, the court has not yet released the result. Junior Clerk shortlist is not yet available. Court may release the result for the posts tomorrow. It was expected that result will be published today, but due to any reason, the BHC has not published the merit list. yes, list will release today. list will come today, please keep visiting us. we will update the link soon. it has not been published yet. ha aj merit list lagne wali h. Junior Clerk Result should come today as expected. which post link are you searching for ? peon post or central recruitment for 8000 posts ? provide the exact URL link for viewing the shortlist candidate numbers on the browser as soon as possible or mail the link on the provided email ID. Link provided. please download the shortlist now.